Background: The networked control systems are becoming progressively more significant and have many outstanding advantages compared to traditional point-to-point control systems. T-S fuzzy systems are nonlinear systems described by a set of If-Then rules. 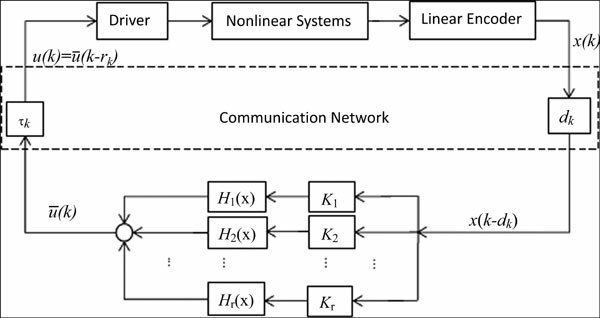 Especially, the combination communication networks with feedback control loops for fuzzy systems are worthy of being investigated, such as network-induced time delays, and control. Methods: Owing to existing network-induced random delays of the forward and feedback communication links in a direct-drive linear control system, we use two homogeneous Markov chains to express the delays. For the stability analysis, the new Lyapunov function and the free-weighting matrix inequality technique are used. Results: A new stability criterion is obtained, and the controller can be computed in terms of linear matrix inequalities (LMIs). The new criterion is less conservative for a new non finite-sum term is introduced in the Lyapunov-krasovskii functional, which brings some adjustable slack variables into the criterion, and can be efficient use of the networked delay information. Conclusion: The new stability criterion is shown to be effective and efficient by the numerical examples. It improves the stability theory of networked control systems and T-S fuzzy systems. Networked control systems, State feedback control, Finite-sum inequalities, Takagi-Sugeno (T-S) fuzzy model, communication networks, stability analysis.